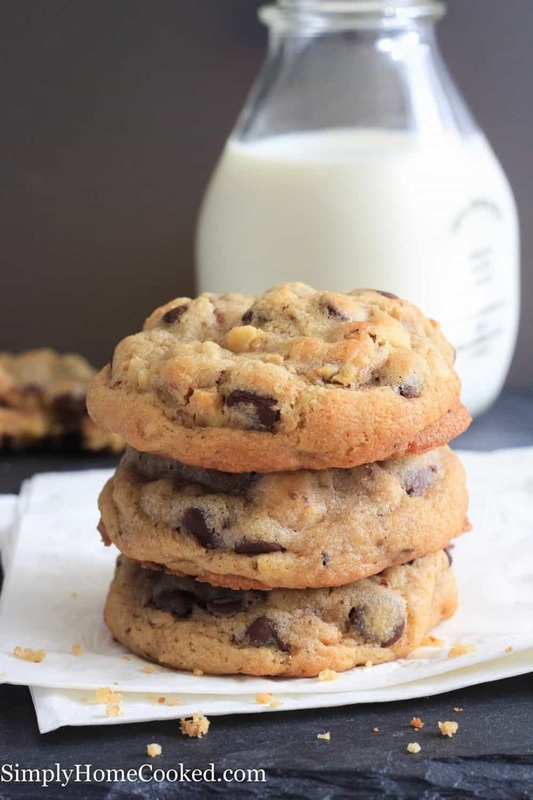 Make these Jumbo Chocolate Chip Walnut Cookies and please a crowd! Full of delicious chocolate flavor with a hint of crunch from walnuts. Add some our Chocolate Meringue Cookies to your cookie tray for a rich but light chocolate addition. This recipe was originally posted April 22, 2015, we’ve tweaked it a bit since then. This post may contain affiliate links. Read my disclosure policy here. 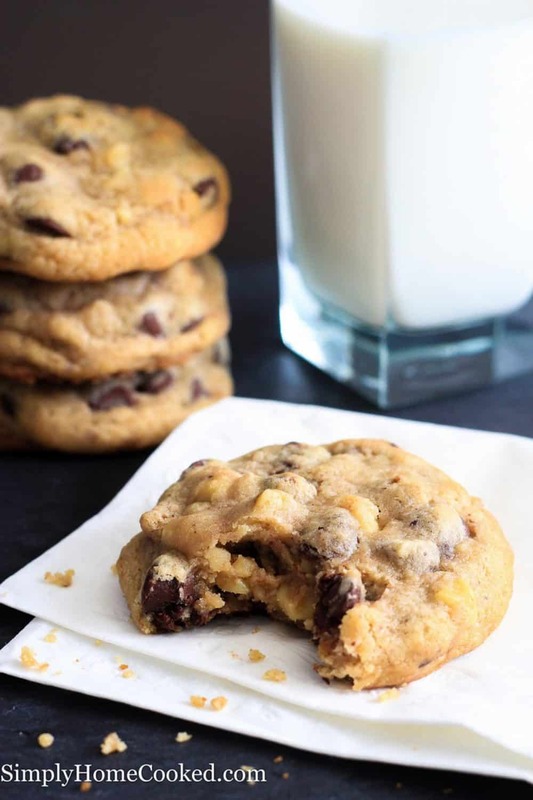 Almost everyone knows what a chocolate chip cookie taste like, but not everyone has tasted Metropolitan Market’s famous chocolate chip cookies. Their cookies stood out from all the others. They were slightly crispy on the outside, but super soft in the middle. And they were loaded with a fine quality Belgium chocolate chips and toasted walnuts. Yum! Ever since I took my first bite into these amazing cookies, they have been my favorite to this day. I can go on all day talking about how great this cookie was, but there was one downside. They were slightly pricey, so I decided to make my own. Below you will find my version of their cookie in this delicious jumbo chocolate chip walnut cookies recipe. I recommend buying a large cookie scoop for these cookies because they cook better in larger scoops. If you don’t have a large cookie scoop, use a quarter measuring cup to measure out each scoop. If you live near a metropolitan market here in Washington, I highly recommend buying Belgium chocolate from there. They actually sell the chocolate they use in these wonderful cookies. The secret to getting a soft center is using shaved chocolate. I just buy the block and chop it really finely. I’ve experimented with this cookie for about 2 years now, and I think I have finally gotten as close to the real deal as it possibly gets. Sift together dry ingredients as directed and set aside. 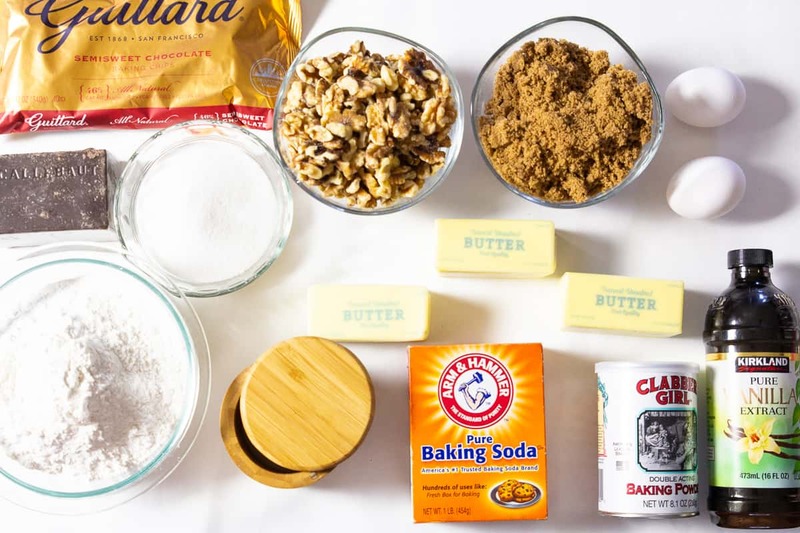 Blend together butter and sugar until well combined. Mix in remaining ingredients in order listed in the printable recipe below. Scoop large portions onto a prepared cookie sheet and refrigerate prior to baking. Serve with a tall glass of milk. 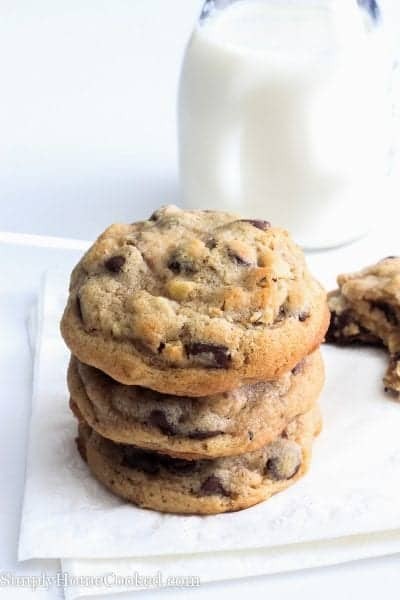 Making this chocolate chip walnut cookies recipe is one of my favorite ways to spend an afternoon that results in a delicious treat. We love cookies in our house, and I know you will too once you check out all of our favorites linked below! Sift the flour, salt, baking soda, and baking powder into a large bowl and set aside. In the bowl of an electric mixer blend butter and sugar using the paddle attachment. Mix on medium speed just until combined. Add in the eggs and vanilla. Then coarsely chop the toasted walnuts. Mix in chocolate chips, shaved chocolate, and walnuts just until combined. Scoop out the cookie dough using a large cookie scoop, and place onto a cookie sheet. Then refrigerate for at least 4 hours. If you don't have a large cookie scoop, use a 1/3 measuring cup. Preheat oven to 370 degrees Fahrenheit and bake for 10 minutes or until golden brown around the edges. Hi Kevin, sorry I am out of the country currently and Im not sure what percent cacao that chocolate was. When I get back I will look at it for you. Hi Kevin, as promised we are back home so I went ahead and checked the percentage for you. The chocolate is 51 %. Thanks for the feedback, Keri! I’ll try that and see if that’s the case here. How do you suggest storing these cookies after making them? Hi Adalynne, I store the baked cookies at room temperature in an airtight container. I never leave comments on any recipe BUT i just have to let you know these cookies are amazzzzzing!!! We couldn’t get enough of them. I now always have them already scooped and ready in the freezer so if we want a little treat i can just stick a couple in the oven. Best recipe! Thanks! Thats so awesome Kristen! I do the same 🙂 Love having ready to bake cookie dough on hand, especially when I have unexpected guests. 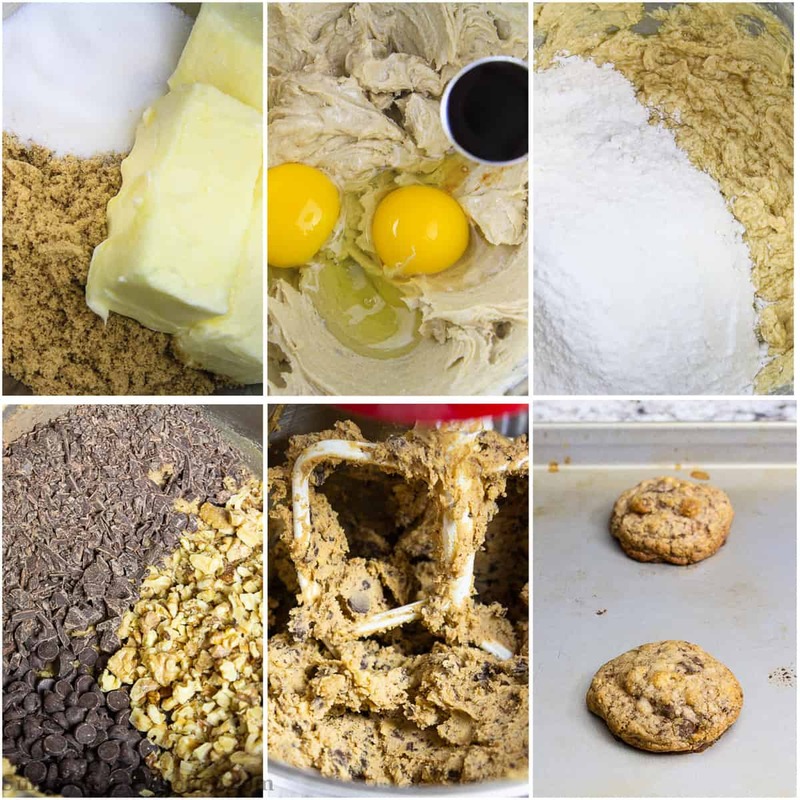 My question before I make these cookies is… When you say toasted walnuts, does that mean you are actually toasting them on a cookie sheet before baking with them? Shall I use salted walnuts? Tried this recipe and it was a huge hit with my family and friends! The cookies turned out marvelously close to “The Cookie” of the Met Market! I only had semisweet chocolate chips, so I put 1 cup of them in the food processor to achieve that “shaved”-texture, and then also used 1 cup of whole chocolate chips. Your recipe wasn’t quite specific about whether or not to grease the pans, so I google-searched it and discovered that with recipes like this one that use a lot of butter, the cookies are already non-stick; any extra grease that you add to the pan will only cause them to spread more, causing them to flatten. So I refrigerated my dough in 1/3 cup size scoops for over 24-hrs, then baked them at 370° F for 15-16 min on a non-greased pan, and they turned out in perfect mounds! (At first I was worried because the center wasn’t completely cooked, but then they continued to cook-through after I took them out of the oven. I let them rest in the pan for about 5 min before removing them from pan.) They were delightfully flaky-crispy on the outside, with a delicious chewy-gooey center. THANK YOU FOR THIS RECIPE! The way I make chocolate chip cookies has forever been changed. I have never written a comment so even though I look up recipes online all the time. I just want to comment that these cookies were perfection! I substituted the flour with organic sprouted spelt flour and had light brown sugar and used a 1/4 cup measuring spoon and undercooked them so they were gooey in the middle. Devine! Wow these cookies must have been pretty darn good for you to leave such a kind review! Thank you! 🙂 I’m glad you enjoyed them. I’m glad this recipe was a winner for you Candice!